Saint Inan (Evan) was a monk and the patron saint of Irvine, where he resided during the 9th century AD. 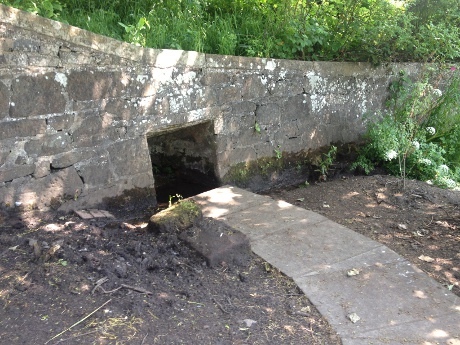 His holy well still exists in the Kirk Vennel beside the Old Parish church, near the River Irvine. He is reputed to have come from Iona . Uinniau is a name now associated with Ninian, a developing consensus being that they are one and the same person. The first news of Christianity was brought to Irvine by Saint Inan. For his first church, he chose a site on a hill overlooking the River Irvine. The hill was close to a ford in the river known as the Puddle Ford or Puddley Doodley as it’s known locally. Townspeople from across the river could use the ford to make their way to St. Inan’s church. The present Irvine Old Parish Church is built on the same place and Glebe Primary School is built on the church ground. Near the school, down a lane beside the river, is St. Inan’s Well where the monk got his water.